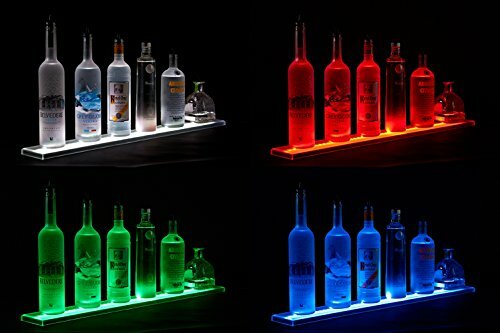 31 Inch standard width LED illuminated Liquor Shelves - Lengh 2' 1"
- Armana standard width LED illuminated Liquor Shelves are the thinnest on the market, measuring in at only .75Ó thick. - Using powerful RGB LEDS that are rated at over 50,000 hours allows you to choose from an unlimited number of colors. - Included wireless remote control lets you choose from predetermined colors and effects, such as fading and flashing. 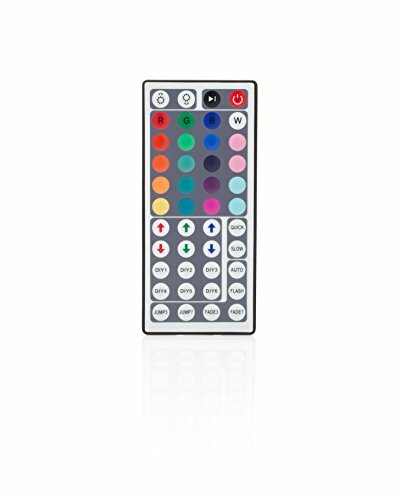 Or, create your own color scheme and store it in the remote for quick access. 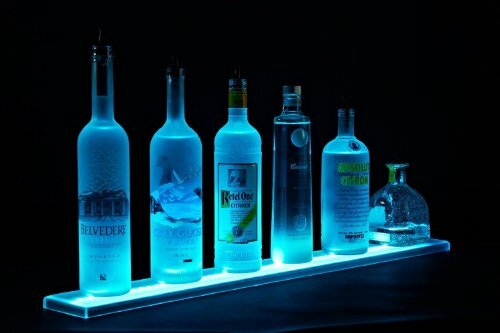 - Our LED shelves are perfect for illuminating bottles, glassware, artwork, or any item of your choosing. - Our rugged design is tough enough to stand on, and with our long last LEDs, youÕll enjoy our shelves for many, many, years to come. - Our standard width Liquor Shelves measure 4.5Ó wide and .75Ó thick. - Armana Liquor Shelves can be connected, up to 16Õ on one power supply and remote. - Our shelves are made modular, so if there is ever an issue with the LEDs or power supply, they can be easily swapped out. 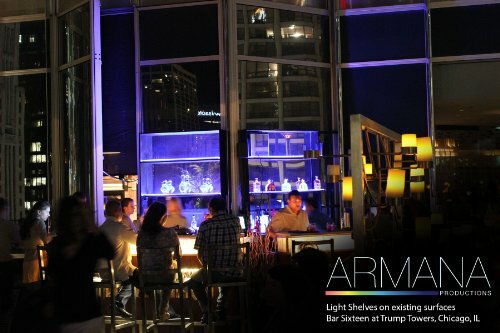 #1 Seller of LED shelving on Amazon - Since 2004, Armana Productions has been creating top-quality products for home bars, restaurants, nightclubs, lounges, retail stores, hotels, and resorts. Shelf Measures: 31 x 4.5 x 0.75 (Length x Width x Height - inches). Ultra slim, versatile design makes it a fit for any bar or entertainment area. 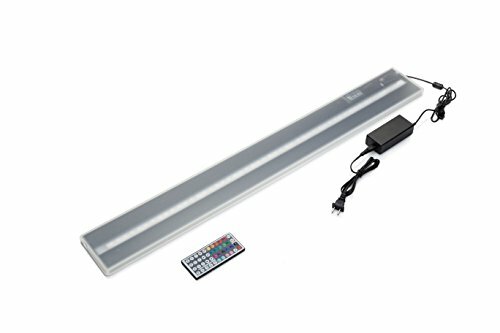 Complete Control and Easy Setup - Includes programmable wireless remote; change the look of any room with an endless number of color and lighting options (color fading, brightness, flashing, and custom colors). Built to Perform and Built to Last - Constructed from high-grade acrylic to eliminate liquid corrosion. LED strips contain 18 bulbs per foot and are rated for 50,000+ hours of use. Modular design allows shelves to be connected and controlled with one remote. 100% Satisfaction Guaranteed - backed by our Lifetime Warranty. Custom sizes and projects are available upon request. 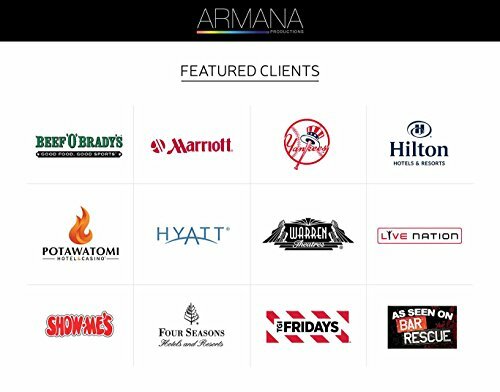 If you have any questions about this product by Armana Productions, contact us by completing and submitting the form below. If you are looking for a specif part number, please include it with your message.